In this newsletter we will outline what is likely to be the devastating effect of the credit bubbles, government money printing and of the disastrous actions that governments are taking. Starting in the next 6 months and culminating in 2011-12 the world will experience a series of tumultuous events which will be life changing for most people in the world. But 2011-12 will not be the beginning of an upturn in the world economy but instead the start of a long period of economic, political and social upheaval that could last for a couple of decades. The US empire was slightly different from the point of view that it never conquered the world although the US was itself a colony conquered from its original inhabitants. But the US has intervened in many areas (e.g. Korea, Vietnam, Afghanistan, Iraq etc.). Also, there are US military bases in 120 countries. Initially the US was an economic superpower based on an entrepreneurial spirit and a very strong production machine backed by fierce military power. But after the Vietnam war the US had overstretched its resources and by 1971 Richard Nixon abolished the gold standard in order to be able to start money printing in earnest. 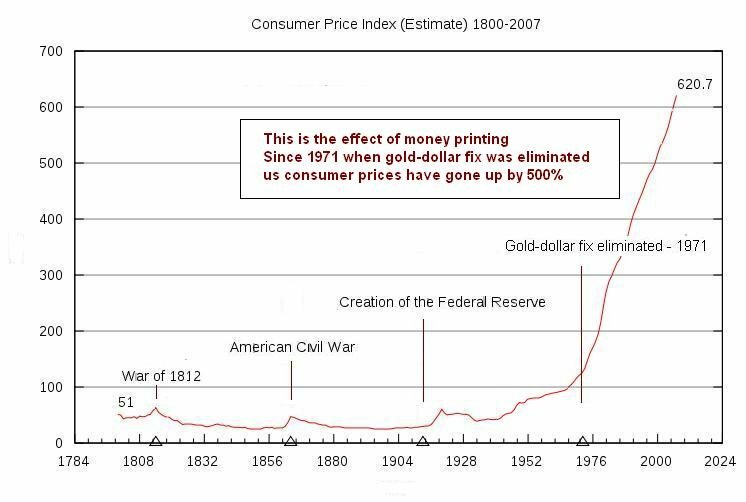 The money printing phase is normally the last stage of an empire before it collapses and this is where the US is now. The US dollar became the reserve currency of the world when the US was strong economically. But as the US economy started to weaken in the 1960-70’s the US government found a much better method for maintaining a strong economy. It started to print paper that it sold to other nations or exchanged for goods and services. For almost 50 years this has been the most clever way ever devised of maintaining the living standards of an economically deteriorating nation without even having to spend any resources on building an empire. It is a Ponzi scheme which has worked for several decades but slowly the world is now waking up to the fact that they are holding worthless paper printed by the US Government. (We realise this is a much simplified version of empire building and destruction but it is nevertheless an accurate analysis). The US is haemorrhaging financially and economically. It has lent or committed almost $13 trillion in the last 18 months to prop up the financial system. The estimated government deficit in the current year is almost $2 trillion or 50% of the budget. All the money committed so far has only achieved two things: Firstly it has created some short term hope which together with totally illusionary sightings of green shoots have generated a small stock market correction (which we forecast in our January Newsletter) and some belief that the crisis is ending. Secondly, all the funds printed so far to save the system have gone to Wall Street but has done nothing whatsoever for the real economy. Every single sector of the real economy is deteriorating whether it is production, unemployment, corporate profits, real estate, credit defaults, construction, federal deficits, local government and state deficits etc. And what is the government doing about it. They are doing the only thing they know which is to print more money. This is total lunacy! How can any intelligent person believe that printed pieces of paper can solve an economic catastrophe? If that were the case we could all go home and write out pieces of paper or use Monopoly money to spend in the shops or repay our debts. How can the US government, the UK government and most other governments not understand that the only way to run an economy is to cut your coat according to your cloth. This is why the emperor had no clothes because the country had run out of gold thread to make the cloth. Until now the US as well as other countries have been able to buy the cloth because the world has been foolish enough to accept worthless pieces of paper as payment. But this is coming to an end very soon and many countries will be without both coats and cloth. What governments are doing with people’s money is to totally destroy its value. Purchasing power in the US and many other countries has declined more than 95% in the last 100 years. While it might buy votes short term it will only generate massive misery long term. And this is what many countries are starting to experience now. But sadly it will get a lot worse. We are still only in the first phase of this tragic saga. The second phase is likely to start in the next 6 months. 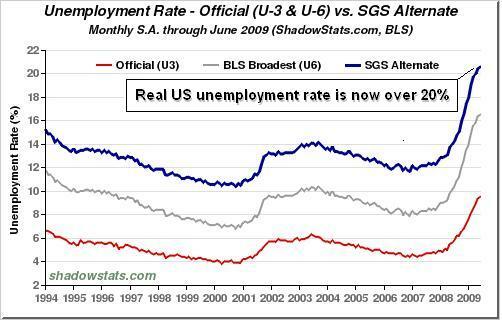 The real unemployment in the US is 20% or 30 million. These are the real unadjusted figures calculated on the same basis as the official figures before the method of the calculation was changed in the 1990’s. Reported government figures, especially in the US, are continually manipulated in order to suit the political aims of the government. Therefore, one should not give any credence to the published figures. Most governments mislead the people most of the time. The consequences will be social, political, financial and the effects on the US economy will be of a magnitude which is substantially greater than during the Depression of the 1930’s. We must remember that none of the problems in the financial system have been resolved but only put on a very temporary hold. The rise in unemployment combined with the reduction in consumption will lead to the next and much more severe banking crisis. Unemployment in Europe is also rising fast and shows no signs of abatement. Many countries are reaching 10% with for example Spain at 19% and Latvia at 16%. But as we have said for quite some time, of the larger European nations, the country with the biggest problems is the UK. Unemployment in the UK is currently “only” 2.5 million or 7% but it is estimated to reach over 3 million by the end of 2009. The combination of government deficits, a banking system which is extremely fragile and too big for the country, very high personal credit that will not be repaid and a housing bubble which still has a long way to fall makes the UK very vulnerable to a major financial shock. During the next 6-9 months unemployment will severely affect most parts of the world including China, Asia and Africa. Never before has there been a global unemployment crisis affecting the world simultaneously. This will not only mean a massive decline in consumption and world trade leading to a recession or depression worldwide but also poverty, famine and social unrest. The masters of the financial circus are the bankers. Not only did they reap the benefits from manufacturing toxic financial products to the extent of receiving bonuses and stocks in the $trillions during the last 15-20 years. But they are also the only beneficiaries of the trillions of dollars that have been printed by governments to rescue the financial system. Why are the bankers benefiting from the rescue of their own banks? Because they are the ones controlling the government, advising the government and making major contributions to the politicians. Yes, many banks are paying higher bonuses in 2009 than 2008. Goldman Sachs is on course to pay bonuses of $20 billion or $700,00 per employee and Morgan Stanley a 30% increase from average per employee of $262,000 last year to $340,000 this year. JP Morgan’s bonus pool for the first quarter of 2009 is up 175% to $3.3 billion and the new chief executive of RBS, the nationalised UK bank is getting an incentive package worth £10 million! Similar bonuses are being paid by many other banks. Barclays Capital for example is on a massive spending spree recruiting executives with golden hellos and guaranteed bonuses of millions per employee. Central banks and governments worldwide have spent trillions of dollars temporarily propping up a totally bankrupt financial system and now a few months later the bankers are back earning absurd money within a banking system which hasn’t been mended and is still bankrupt. This is scandalous. But not only that, they are also back to creating new securitisation programmes in order to reduce capital requirements and increase leverage. Goldman Sachs, and Barclays Capital are doing this already and many other banks will follow. It is exactly these types of programmes that created the financial crisis in the first place and now the bankers are back at it again. This is totally disgraceful and irresponsible behaviour by bankers who have learnt nothing from their disastrous freewheeling actions except how to milk the system to the maximum again. As we have pointed out before, none of the problems in the banking system have been resolved. The system still has a leverage of 25-50 times, it is still full of toxic debt and derivatives, loan books are deteriorating daily, it still has worthless paper assets valued at fantasy prices and most banks are run by the same bankers who created the problems in the first place. For a typical bank, a 4% drop in asset value wipes out the equity. This is what we call a recipe for disaster. In the meantime governments are making feeble attempts at preventing a future crisis by planning new regulations. But these regulations will only deal with known and historic problems. The bankers will again run rings around the authorities in creating new structures to circumvent the new rules. The next phase of this tragic saga will soon start. Compared to the of the 1930’s we are already in a worse position today than at the same stage of the Great Depression. Industrial production is worse in many countries. World trade is worse and the stock market fall is greater than at the same stage in the corresponding period of the Depression and both government and private debt is a lot worse. First unemployment will rise substantially as outlined above and the effects of the unemployed masses will have major repercussions on the economy. This will lead to government deficits growing substantially. Tax revenue is already falling at alarming rates in the US and UK and most other countries but it will get a lot worse. Government expenditure will rise rapidly due to the mass unemployment. Taxes will rise but this will be like getting water out of a stone – there won’t be much revenue to tax. And if Vat or sales taxes are increased this will kill consumption even more. In addition governments will have to implement more programmes to help the poor, hungry and homeless. This will lead to more money printing. Secondly the next phase of problems in the financial system will start by the autumn of 2009 at the latest. Since this will come as a total shock to everyone the effect will be much worse than in 2008. So far US banks have taken losses of $1.1 trillion. Conservative estimates put total losses at $2.2 trillion but realistic estimates are around $4 trillion and this excludes any problems in the $600 trillion to $1 quadrillion derivatives market a big part of which is worthless. In the next round of capital raising for banks there will only be one investor – the government. Thus there will be more money printing. With the escalation of money printing markets will be flooded with government paper which nobody wants, leaving governments to buy its own junk. The two countries with the worst problems are the UK and the US and their precarious situation will emerge first. Within the next few months rating agencies are likely to downgrade both countries’ debt. This will lead to the value of the treasury bonds and gilts collapsing and interest rates quickly moving up into the teens. The higher rates will make the financing costs of the debt to up exponentially leading to more money printing and higher interest rates. This is the “perfect” vicious circle that will end in a hyperinflationary depression. For many years we have been saying that this crisis will by hyperinflationary. The issuing of unlimited government paper will lead to the rest of the world selling their holdings of US/UK treasuries as well as selling the dollar and the pound. Most so called financial experts have been predicting a deflationary recession/depression since they don’t see the demand pull that they think is the cause of hyperinflation. We have been one of the very few (together with the very wise Jim Sinclair) to understand that hyperinflation is a currency driven event. The issuing of unlimited government paper outlined above will lead to the US dollar as well as the pound collapsing. It is the collapse of the currency which leads to hyperinflation. Without fail in history every hyperinflationary event has been caused by a collapsing currency not by demand pull. Many other nations will also experience hyperinflation such as the Baltic States, certain Eastern European and Asian Countries. Many more countries will have high inflation. In the next few months we will see the start of the Dark Years. For the first time in the history of the world there will be a synchronised downturn affecting all nations (although some a lot worse than others).This is the culmination of the world and especially the Western world, living above its means for decades in a mania of credit bubbles, asset bubbles, real estate bubbles as well as excesses leading to decadence and a society with very weak moral and ethical values. (Of course no society recognises this as it is happening but only afterwards). Governments have fuelled this process by printing unlimited amounts of paper thus destroying the money and purchasing power of most nations. The Dark Years will be extremely severe for most countries both financially and socially. In many countries in the Western world there will be a severe depression and it will be the end of the welfare state. Most private and state pension schemes are also likely to collapse. It will be a worldwide depression but some countries may only have a deep recession. There will be famine, homelessness and misery resulting in social as well as political unrest. Different type of government leaders and regimes are likely to result from this. How long will the Dark Years last? There is a book called ”The Fourth Turning” written by Neil Howe. He has identified a pattern that repeats itself every 80 years. The pattern has been extremely accurate in the Anglophile world. We have recently entered the Fourth Turning which is the final 20 years of the cycle. According to Howe we are in the early stages of a 20 year period of economic and institutional upheaval. This is a period of Crisis when the fabric of society will change dramatically. Previous Fourth Turnings have been the American Revolution, Great Depression and World War II. According to Howe the Crisis will be substantially worse before it is over and it will last for another circa 20 years. All of this is not good news and we hope that we and Howe are wrong regarding the severity and length of this crisis. But we fear that we are both right. We must stress again that never previously has the the whole world entered a downturn simultaneously in such a fragile state both financially and economically which is why the Dark Years are likely to be so devastating and long lasting. The correction up in stockmarkets has probably finished but there is a possibility that it will continue for another couple of months. What is important is that it is a correction (we predicted it already back in January) and it will soon lead to a strong resumption of the downtrend. 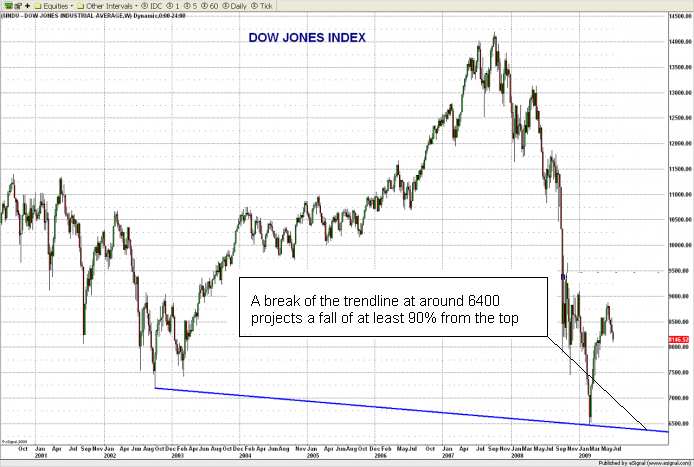 In the Dow Jones, a break of the trend line at 6400 would lead to a projected decline of at least 90% from the top. Almost all major world markets point to similar declines. This sounds incredible but bearing in mind that the Dow Jones fell 90% in the 1930’s and bearing in mind our discussion in the Dark Years paragraph above, this kind of target is not impossible. Some commodity stocks as well as gold and silver mining shares will be major beneficiaries from the Crisis. We forecast at the beginning of the year that US long rates would go up and they have almost doubled since. But this is only the beginning since we expect US and UK long rates to reach at least the mid teens in the next 2-3 years. Interest rates in all countries will go up substantially in the next few years. The dollar and the pound will have very substantial falls in the autumn of 2009. At some later stage the Euro will also weaken as a result of certain countries breaking away from the Euro area. The currency which will be the major beneficiary from the Crisis is Gold. We have invested in gold since 2002 when we saw the Crisis coming. Gold has trebled since then. But this is just the beginning. The next major move will take place in the coming 4-5 months and it will be major. Gold for wealth preservation purposes should be held directly by the investor and stored outside the banking system in his name. Holding gold in ETF form, futures or owning part of gold bars that you don’t have personal access to is not wealth preservation. There is no means of avoiding a final collapse of a boom brought about by credit expansion. The alternative is only whether the crisis should come sooner as a result of a voluntary abandonment of further credit expansion, or later as a final and total catastrophe of the currency system involved. ← WHERE IS THE GOOD NEWS?